At Qatar International Boat Show 2015, held in Doha from 10th to 14th of November, Azimut Yachts displays four of the most representative models from the Grande, Flybridge and S Collections, all of them real masterpieces for each Collection. Grande 95RPH, a real example of Azimut style and craftsmanship, Azimut 80, the first model of the new Azimut's Flybridge era, 77S the biggest and sexiest of the sporty Collection and Azimut 88, a real best seller among Azimut range are the four yachts are presented at the show by the Italian shipyard and the dealer Seas & Desert. Visitors and clients are welcomed in the biggest stand of the show, a innovative and cozy space designed by the worldwide famous architect Michele De Lucchi. 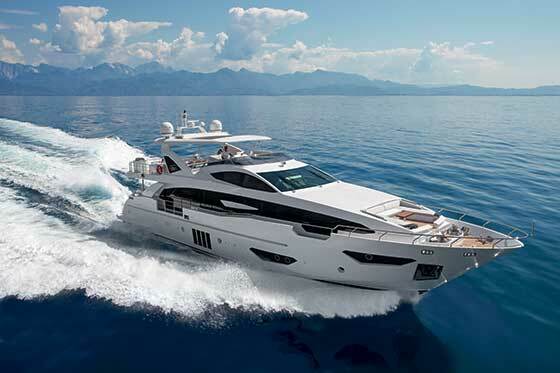 Over the last season the Gulf market has been characterised by a strong growth which allowed Azimut Yachts to significantly increase the sales in this area. Azimut Yachts with Seas & Desert can rely on an active presence in the area with its offices in Dubai, Qatar and Kuwait in order to ensure, according with the company's philosophy, the highest quality of assistance and pre- and post-sales service to the owners.